Based on James’ letter to the dispersed church, I can answer the question in two ways. 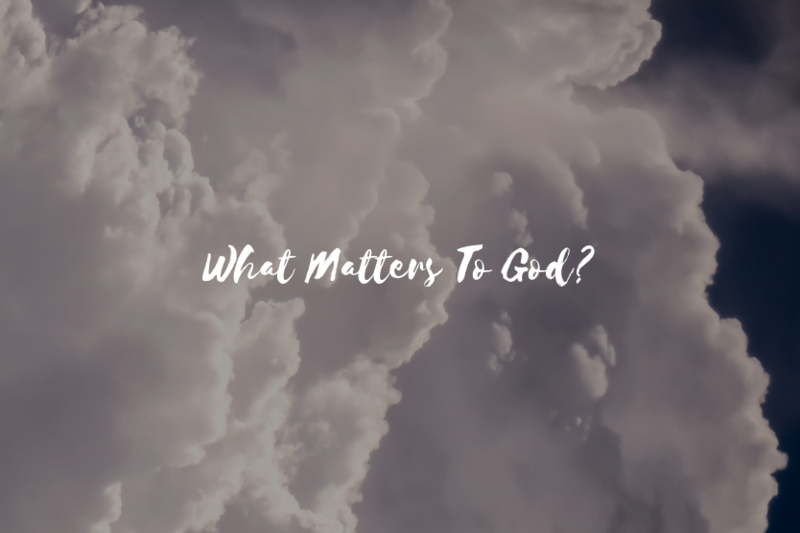 First, everything matters to God. He is not simply the God of Sunday or the God of the worship service. His concern cannot be limited to one day of the week or “spiritual things.” He deeply cares for all of life. Your Mondays and Saturdays matter to God as much as your Sundays. Therefore, everything in your life matters to God. He wants us to be obedient in all things. Second, God cares about the needs of others and how we live our lives. In James 1:19-27, James shows God’s desire that we live Godly lives and treat others with deep love and respect. In the Letter of James, we see that God wants us to control our tongues. Your words matter. Be wise with what you say. Words sting, and they linger. Better to have said little than to say too much. James also emphasizes God’s concern that we live moral lives. He wants us to rid our lives of “moral filth” and “prevalent evil.” We will know how to do this by observing Christ and seeking to be conformed to His image. James talks about the orphan and the widow, two of the hurting groups of his day. God is concerned with those who hurt. He wants us to be concerned as well. James probably thought of the words of Jesus: “Truly I say to you, to the extent that you did it [feed the hungry, visit the sick and imprisoned, care for the needy] to one of these brothers of Mine, even the least of them, you did it to me” (Matthew 25:40). God wants us to be like Him. We were created for this. It matters deeply to God. You can receive all of my daily devotions by subscribing to waylonbailey.com.